One Christmas, I came home from college, and showed my grandmother how to make potato prints. She had never seen such a thing before, and we made sheets and sheets of snowflake-patterned kraft paper to wrap gifts. Grandma would cut up the previous season’s Christmas cards with pinking shears, and use the snippets as gift tags. But that year, she used every scrap of snowflake paper. She said, with a wink, that it was the first trick I’d ever taught her. It had always been the other way around. I loved the simplicity and the thrift of potato printing, but I also love to carve very detailed imagery. Potatoes hold up somewhat to detail, but lose their edges after much stamping. Further, you can pop them into the refrigerator to keep from spoiling, but only for a week or so. I eventually graduated to rubber stamp and lino carving, and have a growing collection. But no matter how impermanent, I will always remember those lopsided potato prints in my grandmother’s breakfast nook. Projects and Techniques in the Art of Hand-Printing. Vanessa Mooncie is known for her crochet and textile work, and has an established career as a silk-screen artist and illustrator. 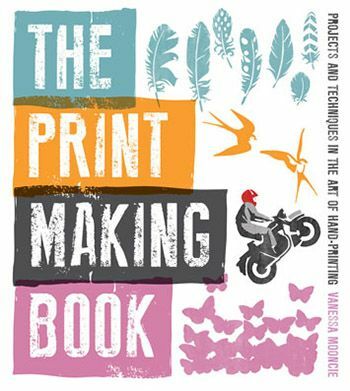 It is clear, when I thumbed through The Print Making Book, that Vanessa took a great deal of time and care illustrating this book. It is wholly appealing. The cover has a watercolor paper texture. The images range from foxes and feathers, lipstick prints and oxford lace-ups, to the line art of a washing machine. And a plumed zebra! 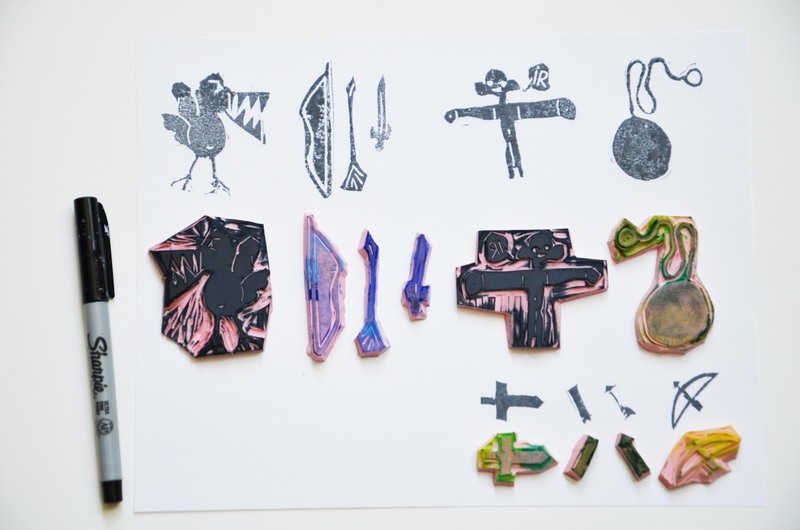 Vanessa covers relief and screen printing, mono and sun printing, plus a section on images transfers and stencils. Each type of printing requires a slightly different toolbox, but once you’re set up for silk-screening, for example, the options unfold. Several of the 23 projects caught my eye. 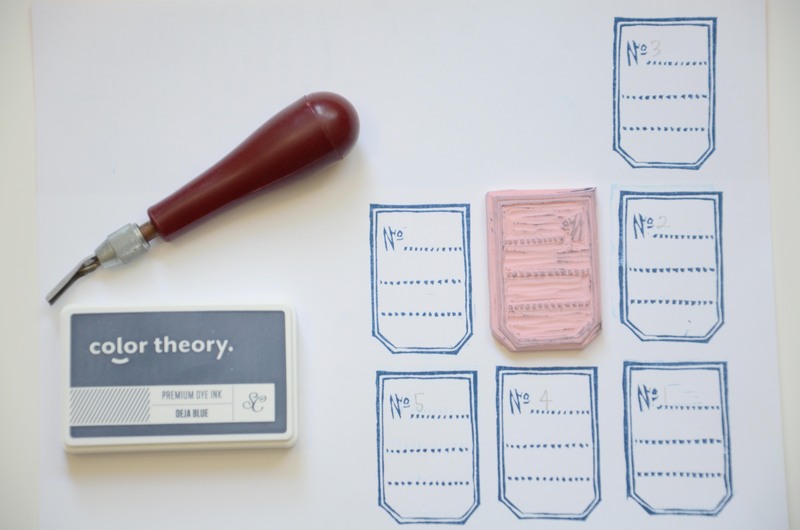 One example is the Eraser Stamp alphabet. I love Vanessa’s block font; it is endlessly useful. The uniformity of the eraser’s size allows for a tidy A-Z set. A few years ago, I carved an alphabet set based on my handwriting, upper and lower case with variations, numbers, and punctuation. 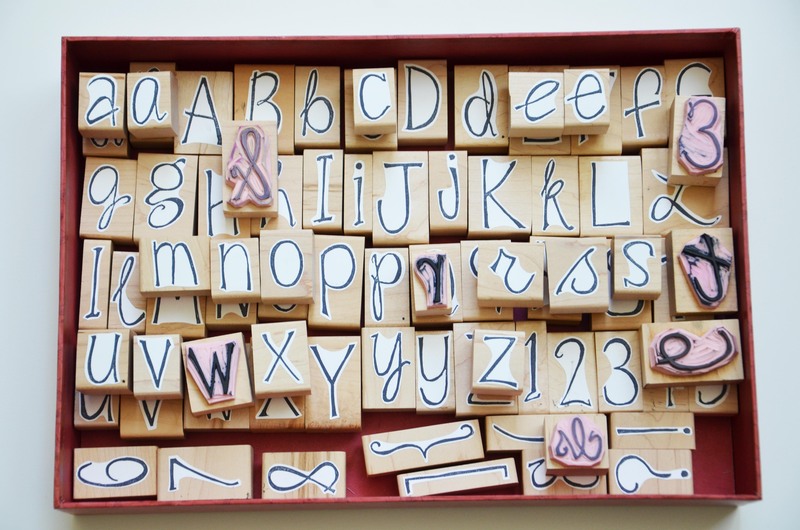 I use this alphabet often, and have contemplated carving a smaller alphabet. There is a useful and fun set of tote bags featuring the plumed zebra and a leaping fox. I’m always reaching for reusable totes. I even plan to use Vanessa’s fox image—a two color template that is crisp and fun. I do not have a traditional silk screen set up, but Vanessa’s how-to is clear. I am eager to learn a home silk-screening method even though I have a small Gocco printer. As many of you may know, Gocco stopped making the supplies for this small-but-perfect set up. It requires screens, and bulbs to burn the image into the screen. And those two things are proving difficult to come by. And expensive. Therefore, I try to make screens that will be reusable in the future. I’m buoyed by Vanessa’s tutorial because then I wouldn’t be limited by any one screen size—I could craft my own! The hunt for frames and screen printing mesh is on. I have a couple squeegees, and I hope to use the inks from my Gocco printer. Stay tuned. Meanwhile, I’m completely at home with rubber stamp carving. 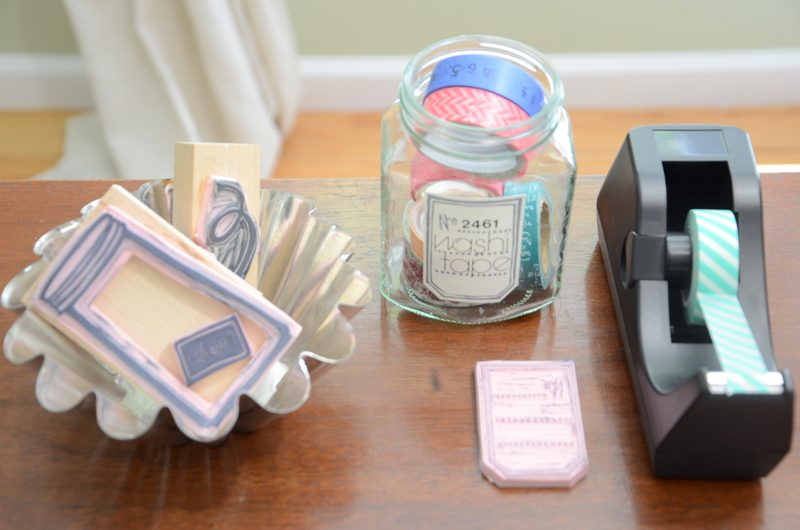 I have carving tools in spades—I use Speedball lino cutters and pink rubber sheets. And it’s something that my kids enjoy as well. In the past, I’ve had them draw directly onto the carving rubber, and remove the negative space. It’s a fine way to get started, but note that your art will be a mirror image, which presents a problem if you have any text. This time, I asked my boys to draw on paper, and they filled up pages of medieval bows, arrows, and shields. And a yo-yo. Then we transferred their imagery by burnishing the pencil onto the rubber. My kids have had many opportunities to carve stamps. (I have formed a habit of writing their names and dates on the flip side for posterity). I set them up on a cutting board, and always give them a safety refresher: keep your fingers out of the path of the blade. I joined the boys, and made a small label stamp—which is vintage in flare. I hand-drew the label, transferred it into the rubber in reverse, carved the negative space, then stamped my first try. From there it took five more passes to clean up my image. I use two main carving blades: a U-shaped channel for swaths of open carving, and a medium V for detailed lines and edges. It feels useful to me in many ways: for the spine of a collection of art journals, for a “Nº 1 Dad” card, for Project Life journaling, for a summer jam-jar canning label. 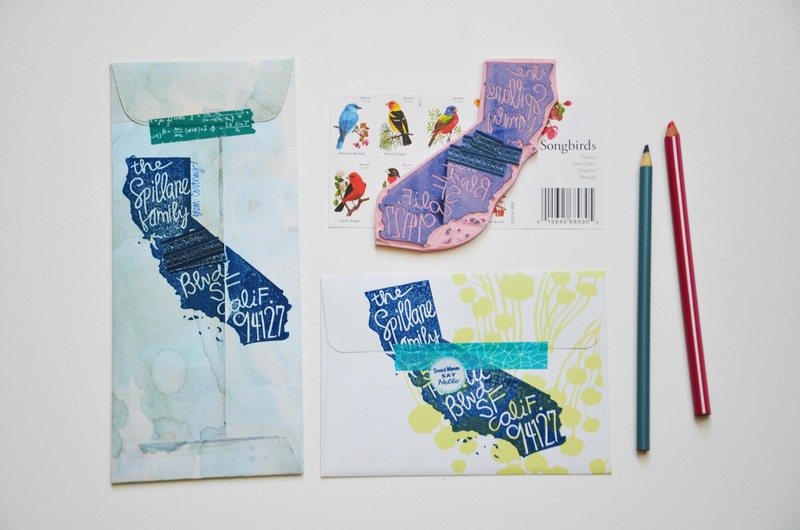 A giant California return address stamp has been on my to-do list for some time. I found an outline of California, and sized it to the rubber sheet. Then I printed out several copies of it, and played around with lettering in our address. Once I arrived at a well-spaced version, I traced with pencil onto tracing paper, and burnished the reverse image on the surface of the rubber sheet. I carved away the pencil markings, taking time around our address, the zip code, and the Bay Area delta. I fine-tuned the southern California islands as a last pass. And while the islands probably aren’t critical to the overall stamp, I really wanted to include the Farallones, and felt it democratic to include the Channel Islands. It’s a sizeable stamp, so I use an acrylic block to make the impression. If the envelope has an overlap or a seam, then I carefully press down on the rubber alone just in that area. It isn’t perfect, but it is handmade. If it bothers you to not get a full impression, you could touch up any bald spots with a matching marker. Gelatin prints are another method of print-making that intrigue me. Like potato prints, gelatin printing has a short lifespan, yet yields interesting and varied results. I have a Silhouette Cameo paper cutter, and while reading Vanessa’s process for making Gelatin-printed placemats, I had visions of all the possibilities: organic shapes like tree rings, bird feathers, and lake outlines. A menagerie of animals. My own line art. The hardest part is deciding what shapes to use. I have a 12X17-inch cookie sheet filled with solid gelatin in my refrigerator—a note on the door reads: Please do not eat or move or place things on top of gelatin!! You can view Vanessa’s artwork at: www.vanessamooncie.com or kissysuzuki.com. There you can learn more about her crochet and knit work, and connect with her on Ravelry. Thanks, Vanessa Mooncie, for writing and illustrating a diverse print-making book that compels me to get my hands dirty, try a new-to-me technique, purchase an enormous box of gelatin, and add to my hoard collection of hand-carved stamps. PS: I’ve got a collection of inspiration for hand-carved stamps, and rubber stamps in general: http://www.pinterest.com/cortneysf/hand-carved/ And if hand-carving isn’t your thing, there are thousands of artisan stamp-makers on Etsy who will make you nearly any kind of stamp you can dream up.